The nineteenth edition of the magazine Mongolica is dedicated to leading Russian mongolists, anniversaries of 2017: Ph. D. K. N. Yatskovskaya (90 years), Doctor of History M. I. Golman (90 years) and Doctor of History V. V. Graivoronsky (80 years old). The article contains the analysis of titles of the main groups, which were carrying out imperious and administrative functions in the 17th century, identification of hierarchy of their statuses. It also carries out the comparativehistorical analysis of a titulatura for the purpose of identification of change of values of terms to the middle of the 19th century when the chronicle Erdeni-yin erikhe was written. 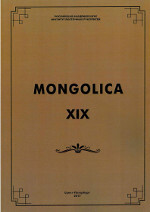 The analysis of original texts showed that the main changes found reflection in ideas of the higher authority in Mongolia, first of all in a titulatura of the Supreme governor. If in chronicles of the 17th century the exclusive power allocated Chinggis-khan and the Mongolian governors — his descendants, in Erdeni-yin erikhe cronicle only the Manchu emperor, the charisma carrier, was allocated with the titles marking the Supreme power, i. e. titles act as concepts. Ideas of hierarchy of imperious persons in Halkha (the khan, jinong, noyan, taiji) remained practically without changes. The article is devoted to the study of the image of Zara Cecene (Hedgehog) as a cultural hero in the Oirat folklore tradition on the basis of the available subjects. The study involves texts from the Kalmyk and Xinjiang folklore traditions. B. Kh. Borlykova. On the collectors of the Kalmyk song folklore of the 19th century — 38 The article presents a brief information about collectors of Kalmyk folk songs: Ivan V. Dobrovolsky, Gabor Balint, Elist Jabdykov, Shamba Sadzhirkhayev, Aleksey M. Pozdneev. Their folklore and musical notations are valuable sources for studying the folklore of the Kalmyks of the 19th century. B. V. Menyaev. About the historical long songs of Oirats of Xinjiang (According to the materials of the magazine “Xan Tenggri”) — 42 The article describes the historical long songs of the Oirats of Xinjiang-Uygur Autonomous Region of China, published in the quarterly popular-science magazine “Xan Tenggri”. Shuna-Batyr and Ubashi-Khan, sung in historical songs, are real persons who lived at a certain time. Texts of poetic folklore were translated from the clear script into modern Russian. A. A. Turanskaya. Names of the Mongolian Khagans in the Colophons of the Uygur Manuscripts and Xylographs — 48 The article deals with the colophons of the Uygur manuscripts and xylographs of the Yuan period that mention the names of the Mongolian khagans and descendants of the Altan urug of Chinggis Khan. Despite their sparsity and fragmentarity they contain important information about the Buddhism spread among the Mongols in the above mentioned period of time. A number of colophons of Buddhist sutras translated from Tibetan into Mongolian contain the phrase debisker-tür baγulγabai (lit. “put down on a mat”). This Mongolian phrase renders the Tibetan expression gtan la phab — a cliché used in colophons of Buddhist texts translated from Sanskrit to designate the accomplishment of the translator’s or editor’s work. The unusual Mongolian translation of this term is probably based on a simple mistake that comes from the visual similarity of the Tibetan words gtan (“completely”) and gdan (“mat, cushion”). The occurrence of the phrase debisker-tür baγulγabai in Mongolian translations of Tibetan colophons reflects a certain trend in the practice of the Mongolian translators of the 17th—18th centuries — the tendency to follow the Tibetan text word by word. In the conditions of expanding ethno-cultural interaction in the world community, the role and importance of cultural heritage naturally grows. Tendencies of globalization of culture are opposed by a massive interest in its ethnic artistic expression, art. Different ways of embodying the ethnic origin at different stages of the cultural development of mankind make it possible to distinguish among ethnic functions of art the ethnic functions properly. An interesting material in this respect is provided by the legacy of the nomadic culture of Kalmykia. Authentic culture of traditional society is in demand today, namely in the modern tourism industry. The published article includes an extract from the A. M. Pozdneev’s last Travelogue of the Journey to the Kalmyks in 1919 telling about his visit to the Denisov Khural, the residency of the chief Lama of the Don Kalmyks, M. Bormanzhynov. The travelogue represents the notes of the author who went on his journey to collect the works of the Kalmyk literature that were used for the opening of the department of Kalmyk Language and literature at the Don University. The author meets on his way the realities of the turbulent times that then engulfed Russia and expresses his deep gratitude to the Bakshi Lama of the Don Kalmyks telling this remarkable man’s story in great detail.